Always remember the fundamentally cool thing about being you! One of my favorite expressions when I’m dealing with difficult situations is “Always remember the fundamentally cool thing about being you!” Whenever you deal with trying times you go back to the skills, knowledge, and personal characteristics that you should take pride in. That said, every once and awhile its nice to have some external things that provide a nice prop. These life experiences and mementos act as little touch points on which to hang your hat. Well this week my external props got added to. Several years ago, I had the chance to attend a reception with Stephen Hawking as a Physics teacher that was a pretty neat moment. I wrote about that in an article “A brush with Greatness” – which would have been a blog post if we had blogs then. In 2002, I attended a Cisco conference where Chuck Yeager was giving a talk and got him to sign my logbook. As a pilot that was a pretty cool feeling. Last Month, I attended a CFL game to watch my Edmonton Eskimos a team I have cheered on for 30 years. 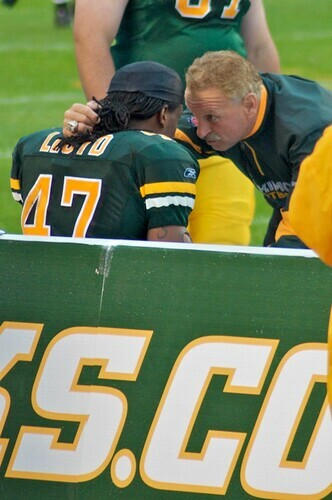 I took a picture of one of my favorite Eskimos Dan Kepley who is now a coach. That picture along with Coach Kepley’s signature sits framed on the Wall of my den. I may not be a Nobel Laureate, broken the sound barrier, or won a Grey Cup, but I’ve gone out an experience life and got to meet the people that have. And that’s more than good enough for me. In the end it is the memory of the experience not the photo on the wall that makes it cool. The football game was with my Dad, the Hawking reception was with my friend Wayne. Both pretty cool people in their own right. And this is three of a couple hundred experiences I think about, when I think about what’s cool about being me.